Our businesses are always evolving, but we don’t always rush to change our brand with every change in our business, because brand consistency is so important. However, there comes a time for many of us that we realize we have outgrown our brand. That happened to me in 2011 but this realization was long in the coming. In 2006 my business changed radically. That year I became a certified Strategic Attraction CoachTM and began integrating the Attraction Consulting into my design business. Through the deep inner work inspired by the Attraction Planning process, I saw more clearly what is most important to me. At that time I started calling myself The Magical Marketer, created the Branding from the Heart system, and began teaching conscious entrepreneurs how to attract their perfect customers with an authentic approach to marketing. Clearly I had moved beyond my original brand, “Graphic Girlz” into a whole new realm of marketing. However, for years I kept my old brand because I already had a decade of marketing invested into it. I needed to work with a couple of high end branding experts to help me make the necessary change to the Magical Marketing brand. Now I have been working with Magical Marketing as my brand for over a year and my business has grown, more people are visiting my website, and I’m getting more inquiries and referrals than ever before. Standing here and looking back, I wonder why it took me so long. An even better question is how can I help others before they’ve been living with an outdated brand for too long? So I have come up with 4 Sure Signs that Your Brand is Outdated. Check these signs against your brand to see if your brand has been outgrown by your business. Outdated Brand Sign #1) Your Brand is about a specific offering but you offer way more than that now. For instance, Graphic Girlz is clearly about Graphic Design but I offer Brand Strategy and Attraction Marketing Services. That’s a good sign the Brand needs to expand to cover all the offerings. Outdated Brand Sign #2) You have had a philosophic shift that your brand doesn’t reflect. 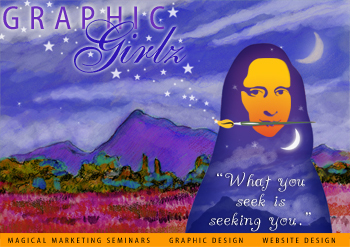 For instance, I created Graphic Girlz as a graphics services partnership in 1995. In 1998 my partner left and I had a deep spiritual shift which led to involvement with Law of Attraction principles. Outdated Brand Sign #3) People express confusion about what you actually do. I recently had someone I’ve been networking with for years say to me, “but you don’t do logos, do you?” When people who know you are confused about your offerings, it’s time to upgrade your brand message. Outdated Brand Sign #4) You are embarrassed to show your brand to anyone. 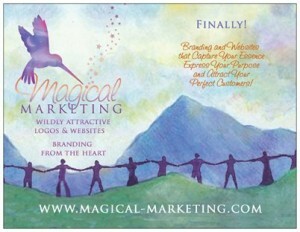 Do you apologize when you hand your card out because your brand is not a great representation of your brilliance? This is a sure sign that it’s time to upgrade your branding. An embarrassing brand is not an attractive brand! Are you ready for a brand that is a true reflection of your vision, your purpose, your personality and your attraction plan? Shining your light to the world is your destiny. Let me help your light be a beautiful, authentic and wildly attractive one. Apply for your complimentary Magical Strategy Session at http://www.magicalstrategysession.com/ or call Julia at (707) 823-3316 to schedule your appointment.